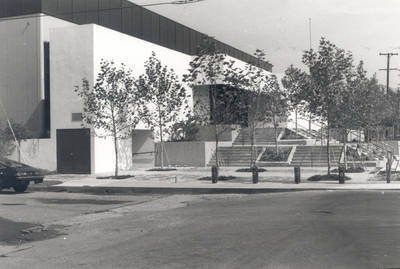 "Harold Hutton Sports Center, Chapman College, Orange, California"
Hutton Sports Center, 219 E. Sycamore St., Chapman College, Orange, California. The Harold Hutton Sports Center completed in 1978, is named in honor of this former trustee, and made possible by a gift from his wife, Betty Hutton Williams. Renovated in the mid 1990’s, this building (2 floors, 45,254 sq.ft.) houses the Athletics department, gymnasium, and the Julianne Argyros Fitness Center, a gift from long-time trustee George L. Argyros to his wife.